I decided that I wanted to create something unique to hold utensils for my father-in-law’s surprise birthday party. I happened to be in the crafting aisle in Walmart when I noticed both the unfinished wood plaque and terracotta planters. I decided with some paint and glue, they’d be perfect! I took the planters and wood outside and spray painted them with a few coats of the colors I had on hand, which on this day was white and black Rustoleum brands. I also sprayed a clear sealant coat on top of that. I let them dry until the next day. I wrote with a chalkboard marker on a chalkboard sticker what each planter held, and stuck it on the planter. I put a napkin inside the planter so the bottoms of the plastic ware didn’t come into contact with the painted bottoms. That’s it! Not too hard at all and you can customize it however you want! 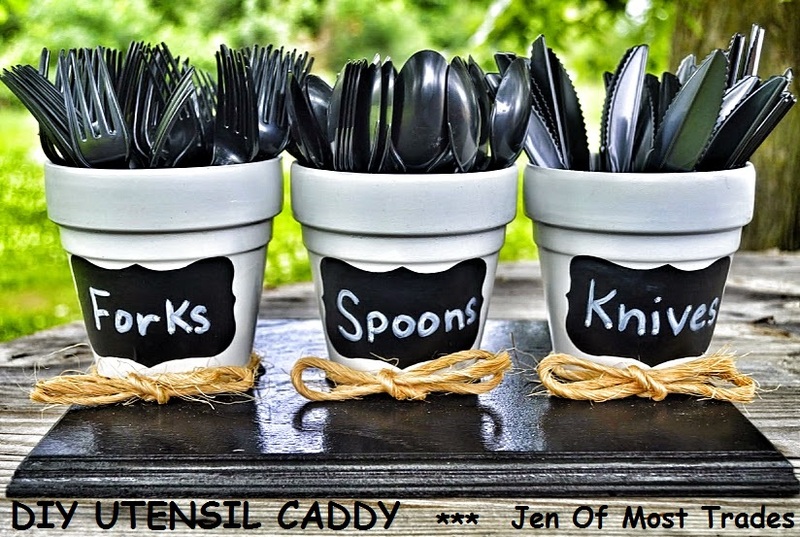 You could also use this as a little herb garden instead of holding utensils. Lots of possibilities and it’s fun to make. Are you going to try this? Have you ever made something like this before?